Two of the newest team members at Gator Country will soon be offering their insights about Florida football. 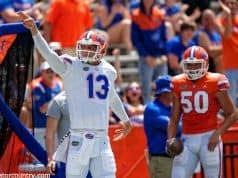 Scot Brantley’s defensive analysis and Reidel Anthony’s assessment of the offense will be a regular feature soon on GatorCountry.com. Stay tuned for information on how your questions can be sent to them and possibly reviewed and/or addressed. Scot is a regular around Gator Country, where he has authored columns in the past and appeared on various radio and TV shows. The former All-SEC linebacker and third-round choice of the Tampa Bay Bucs continues to offer radio analysis with the Gator Radio Network. Recently he was name to the Florida-Georgia Hall of Fame. “What I like about the Gator Country readers is that they know their football,” said Brantley, “and they bring a lot of passion. And anybody who saw me play football knows how seriously I take that word ‘passion.’ In fact, I think ‘want to’ is the key to playing good defense. Reidel was a consensus All-American for the Florida Gators on Steve Spurrier’s national championship team in 1996 and No. 1 draft choice of the Tampa Bay Bucs. He is receivers coach at Trinity Catholic in Ocala. 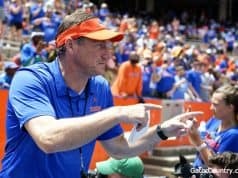 “I am excited about doing this offensive analysis column for Gator Country and writing about the Gators’ explosive multiple attacks that they can feature,” said Anthony. Brantley and Anthony are both on the Trinity Catholic staff of John Brantley, Scot’s brother and former Gator teammate. Stay tuned to GatorCountry.com for more announcements this week.